I am the hyperbole queen and didn’t even know what it meant. I must have been sick that day. When friends said, “You’re so hyperbolic,” I probably thought they said, “hyperactive,” and nodded my head. 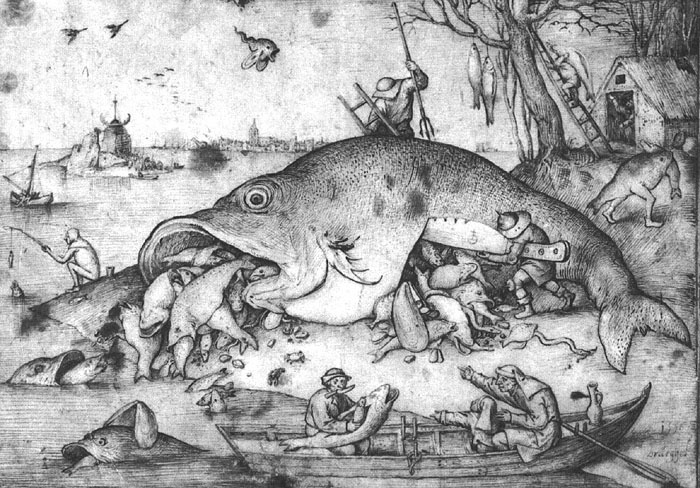 The original big fish story. A hyperbole is an exaggeration that is not to be taken literally. The name for “exceeding the truth,” originated in the 1500’s in Greece. 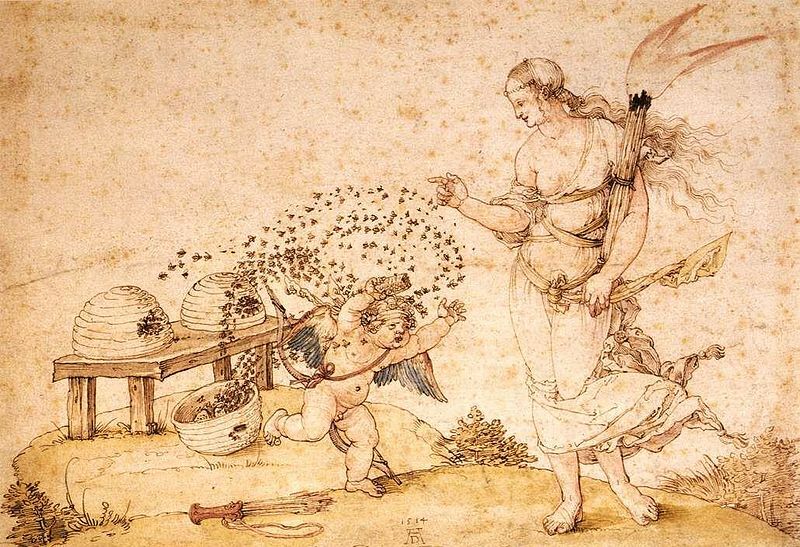 Cupid’s about to get stung by a zillion bees! Greece was also the birthplace of Greek Mythology and Hercules. Take a look at the engraving below. Cacus may breathe fire, but both men are pretty average-sized. I imagined the God of Strength rippling with muscles. And what’s up with fighting naked? Vulnerability comes to mind, not strength. 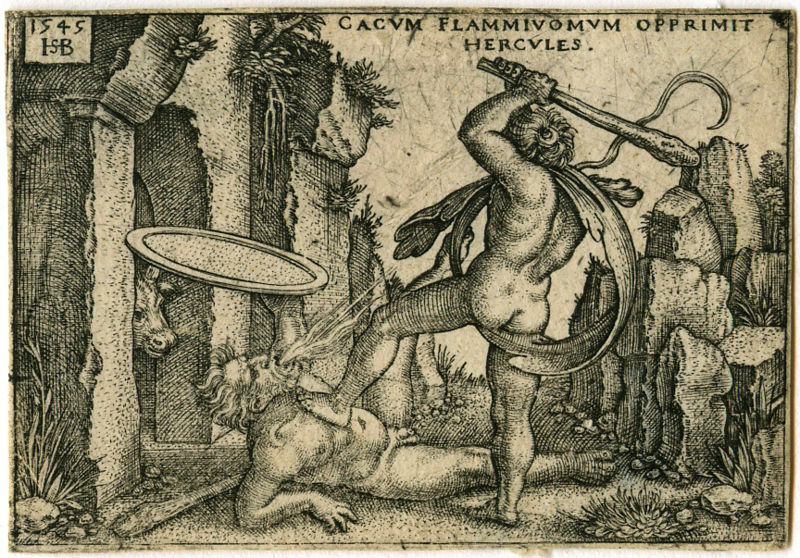 If this is what Hercules really looked like, than his character description is the epitome of hyperbole. If he’s not careful, he may be headbutted by that cow and could fall into that spiky undergrowth. Youch! All three of these renderings and the origin of hyperbole are from the 15th century. Coincidence? “Bringeth on thou’s greatest exaggerations!” said no one ever. Hyperbole is alive and well and can be found at the 2014 Olympic Games. Here’s an example from Sage Kotsenburg. He’s on Team USA’s Slopestyle team and tweeted this before Shaun White dropped out. The next tweet could be called an under-exaggeration. Here’s a retweet from Shaun White promoting his new album. I bet Team USA will win a boatload of medals in the 2014 Olympics. Okay. I may be hyperbolic, but I can dream! Do you tend to exaggerate? If you do, did you know you’re hyperbolic? Exaggeration doth drop from my tongue in 43% of mine conversations. When it doth, I get me to my hyperbolic chamber and I am slightly improved, forthwith. Hahaha! Didest thou seest the Opening Ceremonies? Mine eyes could not believeth the spectacle! Russia’s committee must have worketh one trillion hours! This year, you can watch EVERY event at your leisure on Pay-per-view only it’s free! Did you see the Opening Ceremonies? How did they project that? It was like a million holograms! Great post! Must admit the Winter Olympics haven’t been too big a splash here in NZ. I think we have a team there. I know of a journalist who’s gone. Possibly it’s because I don’t watch TV rather than because of any lack of actual interest nationally. Ha! A man after my own heart. I can imagine us talking to each other. We could go on like that for days, weeks, MONTHS!!! I missed the parade in last night after being caught in traffic. I just looked it up. You have 60 athletes! Hey the Jamaican bobsled team is back! I can’t wait to watch them. Here in the States, cable is providing on demand Olympics. We can watch anything we want! In the past skating and skiing/snowboarding dominated. nothing beats the Olympics, nothing… it’s nationalism at its finest – GO USA. There is no wonder why many of Russia’s athletes train here, in the good ol’ USA. Yeah! You betcha! I love it too. I skied all morning and now I am watching Bode Miller tear it up! Thar be giants at the Olympics? That Serbian guy must weigh a ton! Love your images from ancient Greece. I’ll be exaggerating all day now. Exaggerating is what I do best! It was funny how it all came together. The Serb is humongous! Thanks so much and for stopping by. Hardly, but I am good at exaggerating everything! See?? ?